Sports Injuries and Arthroscopic Surgery of the Hip, Shoulder and Knee. 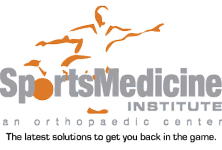 See the Sports Medicine Institute in Clermont for the advanced, specialized solutions you need. When you’re working hard to be your best, a painful sports injury is frustrating. You want the most effective treatment available so you can get back to your active life, feeling strong and performing at your peak. The Sports Medicine Institute’s physicians are board-certified specialists with fellowship training in sports medicine, joint reconstruction and joint replacement. Our doctors and staff offer years of experience and advanced training in the best new approaches in sports medicine, plus comprehensive orthopaedic care for people with all kinds of bone, muscle and joint problems. Along with the latest in sports medicine, you’ll get the partnership and attention you need to feel comfortable and confident in our care. We work closely with you so you’ll understand all your options and know what to expect. Learn more about the Sports Medicine Institute and call us with questions or to schedule an appointment. Visit the Forms and Patient Info page. Either discuss your needs with the person who answers the phone or choose from one of the options given. Tavares, Orlando, Clermont, Minneola, Montverde, Groveland, Mascotte and all of Lake County.